The Peanuts gang is getting in the holiday spirit! 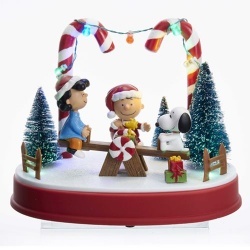 This charming Peanuts Animated Musical Musical LED Statue Charlie Brown, Sally, Snoopy and Woodstock playing on a seesaw in front of a Christmas wonderland. This Peanuts Animated Musical decoration lights up and plays music. 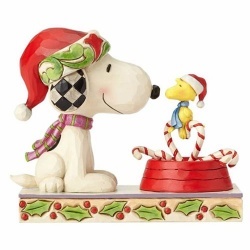 Snoopy in Santa's hat and Woodstock perched on candy canes in the beagle's bowl discuss their holiday plans in this delightful Peanuts Snoopy and Woodstock Candy Cane Christmas Statue from artist Jim Shore. Made of stone resin, it measures 6-inches wide x 5-inches tall x 2 1/2-inches long. If you think that happiness is getting together with your friends, then this is the pint glass for you! It features an image of the Peanuts gang all hanging out together around Snoopy's dog house with the words, "Happiness is… Getting together with your friends." 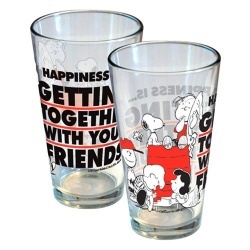 This awesome Peanuts Happiness Is Getting Together With Friends Glass will have you reminiscing with the Peanuts gang in no time. There are a lot of life lessons that you can learn from the Peanuts, especially Snoopy. 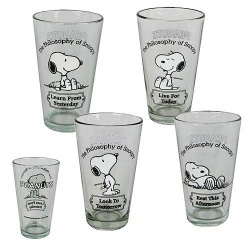 This Peanuts Philosophy of Snoopy Pint Glass 4-Pack will remind you how much simpler and happier life can be when you follow the philosophical teachings of Zen master, Snoopy. Featuring a different image of Snoopy dog on each pint glass, this awesome 4-pack is the perfect thing for Snoopy and Peanuts fans. Barney and Betty Rubble are all lovey-dovey in this irresistible stone-resin statue from artist Jim Shore. Measuring about 6 1/2-inches tall x 4 1/2-inches long x 3-inches wide, the Flintstones Betty Kissing Barney Romance Statue based on Hanna Barbera's The Flintstones reflects Shore's unmistakable compelling style. Wilma Flintstone and little Pebbles strike a charming mother-daughter pose in this delightful piece decorated with Jim Shore's trademark rosemaling designs. 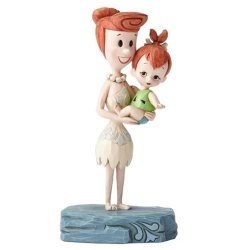 The Flintstones Wilma and Pebbles Bond Statue is crafted of stone resin and measures approximately 5 1/2-inches tall x 3 1/5-inches long x 2 1/2-inches wide. Hit the ice with your favorite teammate! Sidney Crosby is wearing his black and orange Pittsburgh Penguins jersey. 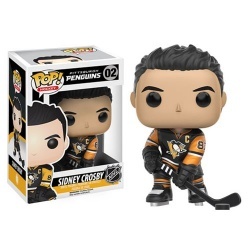 The NHL Sidney Crosby Pop! Vinyl Figure measures approximately 3 3/4-inches tall and comes packaged in a window display box. Everyone's favorite lasagna-loving cat, Garfield is ready to come to your home! 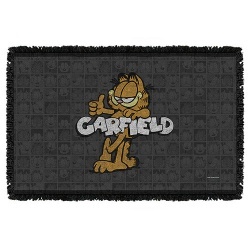 The Garfield Retro Woven Tapestry Throw Blanket has a fun design that features everyone's favorite cat. Measures about 58-inches wide x 36-inches tall.